When I was a tyke they gave us map-reading aptitude tests. I loved those tests. Ever since, I’ve tried to stay one jump ahead of the rest of the class. Now I’m an old guy. Anybody who knows me knows I get stuck in a good map, like anybody else might get stuck in a good book. In fact, on trips, I no longer bring a book to read. It can be a camping trip, a foreign trip, no matter where I go I know I’ll just be reading maps. It’s relaxing for me. Sometimes after staring at a good map for a really long time, suddenly there it is: the perfect route, the perfect camping spot. Or in a city, something fun beyond the bridge, that I would have totally missed. On any trip, I’d rather have the perfect map than the perfect guidebook — or even the perfect guide. It’s fun having that freedom to just explore on your own. Maps let you do that. It’s not uncommon to know things even most locals don’t know, based on serious perusal of a good map. Come to think of it, in our house, we even decorate with maps. The maps get the premium wallspace. They are our art. This article is about how I’m doing topos now. So it’s about topos specifically. Much of what I say though is equally applicable to city maps or road maps, like you’d use on other kinds of trips. Every trip is different. Every trip needs maps. But topos have a special place in my heart. In fact looking back across the panorama of my life, I’ve come to realize that most of my best memories just would not have happened the way they did, if not for a good topo. Like the title says, I’ll talk about where topos are today, and where I’m pretty sure they will be quite soon. I’m not going to clutter up the discussion with links or specifics. But I did include a rather elaborate appendix for resources and technical details. 1) At the house. Here you have fast internet, full strength computing, and printing. You have 100% of your resources, no limitations. Unfortunately, this is also when you are usually the most pressed for time. You might be packing for the trip. You know where you’re going, but only in a general sense. This is the only time you can print to paper. Yet you haven’t really thought through the specifics of the trip, and you don’t want to. 2) On the road. This is when you really might feel like studying maps, specifically looking for tomorrow’s route, on the edge of the bed in a motel room, or beside a campfire. I usually have a computer, as well as a file-full of useful paper maps. But it’s best not to need or expect much by way of internet. 3) On the trail. No internet of course, and whatever you’re carrying should be lightweight and durable. This generally means paper. But the trouble with paper is you need to have had enough forethought (and time) (and energy) to do the printing while still in stage #1 at home – when you least feel like it. The USGS officially finished mapping the country in 1992. Since then, as we all know, paper topos have been going down hill. 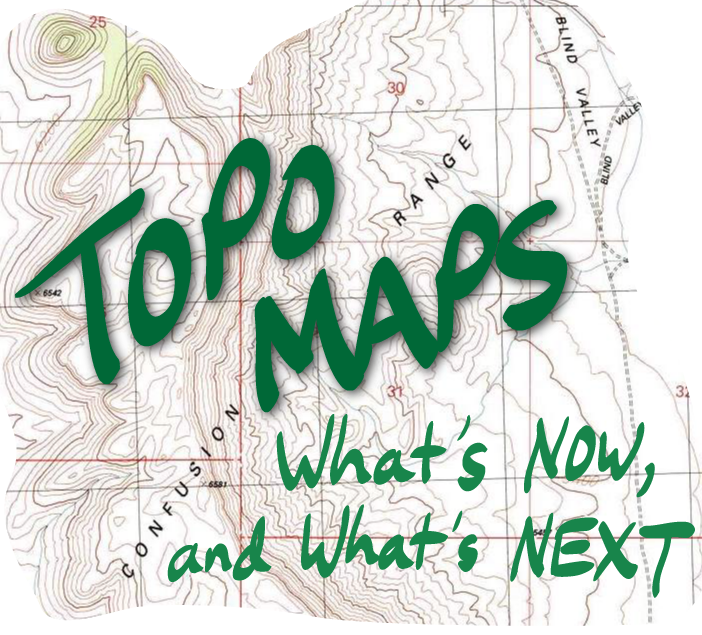 In the appendix, I’ll talk some about the The National Map, and the US Topo project, which has huge momentum right now and is proof that topos are still alive and well. The new quads are all digital. This could be because the government is ornery, or so insulated from its customers it can’t give us what we want, or maybe just so cheap it would rather you did the printing self-serve. But actually in this case, it’s none of those things. There are good and valid reasons for all maps and mapping products to be digital, from now on. Just for starters, the new topo quads are free for anybody to download. That’s $6-$8 cheaper per quad, just by getting rid of the friction of paper. The raw quads from the government aren’t anything I would ever use, really. But what’s important here is that since they are digital, and free to the public, they can be fluidly repackaged into all kinds of inexpensive third-party applications and products. Here are some things you can do with a digital map (depending on the product) that you can’t do with a paper map: Zoom out, move someplace else far away, then zoom in, pulling data off a server someplace on an as-needed basis. Pan and center for the perfect view, never running off the edge of the map, because there is no edge. Trace an interesting route on the map with your pen, then instantly generate an elevation profile showing exactly how hard or easy the hike would be — how much climbing, overall distance, how steep. Markup the map with different color waypoints and notes, then hide the whole ugly mess, or display only the one route you’re interested in. Easily turn layers off and on to present the simplest, cleanest picture depending on your needs. Search for, and jump to, a specific mountain by name. Receive corrections, fresh imagery, minor or major changes, the moment they are uploaded by cartographers. I mentioned that the new US Topo quads are not usable in raw form. Why? Well for one thing they have edges, just like the old topos. But more importantly, there is a TMI problem — too much information. If you display all of the available layers, the map is unreadable, hopelessly complex. If you display the contour layer only, it’s very clean, but you get no clue about surface characteristics like vegetation or rock. The image layer is fine-grained — nice — but toggling between the contours and the imagery just isn’t something that works. It’s helpful, I think, to jump ahead of ourselves and imagine what the perfect topo of the future might look like. For starters it would display on a durable, lightweight device with an 8-10 inch screen and no battery problems, something you could toss in your daypack. It would show surface imagery and contour data simultaneously without TMI overload, through some kind of 3-D trickery — you could zoom, tilt, and rotate the landscape any way you wanted to, and see what it really looked like. Yet, the underlying locked-down numerical data, elevations and such, would be easily available by hovering. The various layers, imagery, man-made features, contours etc, would be a mashup from various sources, but freshness dated. It would usually be nicely current, from the last year or so. And there wouldn’t be an edge to the map. None. This shouldn’t be hard to imagine. In fact, you’ve already had it in your hands and played with it. It’s Google Earth. It’s not hard at all to imagine Google Earth playing from local data, i.e. off-line, on something like an iPad. Throw in a little red wandering dot on the map — your actual location based on GPS. That would be a pretty nice topo. All of the pieces for this are already here. Early adopters from the geocaching and orienteering, aviation and nautical, hunting, and GIS communities are already putting the pieces together and playing with them. It won’t be long. Meanwhile back at the present. Here’s what I’m doing now. I don’t have an iPad, just decent internet, a computer, and a printer. Let’s use the example of going into a brand new area for several days, for hiking and camping. Let’s say that, in my usual way, I’ve been anticipating the trip and drooling over maps in spare moments. Now it’s time to think about actually packing. What is it I’m going to want on the trail, or away from internet? I’ll describe a rather complete job of packing, it might take me an hour or two. But bear in mind this only has to be done once. If I’m going back to an area I’ve been to before — which is usually — all I need to do is pack up the bundle from last time, and maybe print off a couple new routes I might be thinking of. So here goes. 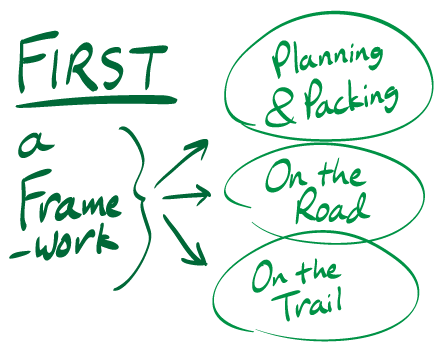 First, a good overview — where are we likely to camp and hike? This information has usually self-assembled as though by magic. Ideas from guidebooks, talking to friends. But also, for the big picture, just a standard statewide recreational atlas like you can buy at a truckstop or outdoor store, either Delorme or Benchmark. In spite of all I’ve said about digital, these still get used. Also, good old Google Maps. Not Google Earth — I’m talking about Google Maps, especially terrain view. I include some tips on how to use Google Maps in the appendix. Useful at this stage too would be land ownership maps, especially the Forest Service and BLM travel plans, and any other specialized maps I may have collected. For popular areas there may be a Trails Illustrated available, they’re perfect for overview. I’ve probably nosed around in all this material already. Actually, I probably already know where we are likely to be hiking. For the actual 7.5-minute topos I’ll be bringing, I use two products in 50-50 combination — Google Earth, and National Geographic Topo. Following this article in the appendix I discuss some of the pros & cons, and nuts & bolts, for both these products. Like any packing project, it’s about "What am I going to wish I had, when I get out there?" When I leave the house I’m leaving fast internet behind, and printing. Map data is enormous, its proper home is on a server someplace. So packing is about transferring the maps you will need onto your hard drive for the trip, and printing anything you would like for the trail. National Geographic Topo costs $50/state. I own Montana, Idaho, Utah, and Nevada, so that’s a $200 investment. It’s nice though being able to quickly view a detailed topo anyplace in any of those states. The data amounts to 13 GB, which I mounted on an external hard drive at the house, and also to my cloud drive. I use both — the USB drive is a bit faster if it’s convenient, but the cloud drive is really nice for reading topos on the couch, or from the road where I might have internet. Google Earth is free of course. Most people assume it requires an internet connection, but once you’ve gathered the data it works wonderful off-line. Actually it’s even better off-line. There’s no skipping or halting, it’s like a dream because it’s pulling everything it needs at high speed from local cache. You end up with a 3-D model that you can turn in your hands, reading in a lawn chair, soaring in and out to explore at any angle or scale. If you have flying dreams, you know what this feels like. The actual packing process goes like this. I open NG Topo and Google Earth side-by-side, then zoom into a similar view on both of them, clearly showing the area we’ll be going to. Toggling between them it’s easy to locate, let’s say, five or six trails, campsites, or general areas we’ll probably be interested in. Using my pen (a mouse works fine too) I quickly sketch some of the trails in pink, and some of the access roads in orange, in Google Earth. This makes the area of interest really pop out from any elevation. It’s nice to do anyway because later I can view the elevation profile on these same paths, to see what the various hikes look like. With the area now defined, I draw some data-gathering spirals in green. I describe this technique in the appendix — it’s quick and easy. I clear the old cache, then set it to run a repeating tour on the spirals. The image data pours in at a steady 3 Mb per second. Since it’s going to collect almost 2 gigs, I can work on the NG Topo piece while GE scuttles about the countryside by itself. In NG Topo now, I print off anything I might want for the trail. 8.5 x 11 works fine. At the default scale that will show plenty for a good long dayhike. I print to map paper, usually two sides, usually just a couple sheets, but sometimes 8-10 views if it’s a brand new area. When the printing is done I trim them with scissors or a papercutter so they fit nice in a ziploc. I like to give them titles, too, with a purple sharpie, it makes them quicker to find later. These printed maps get tossed aboard with the other paper reference — Forest Service travelplan, guidebook, Trails Illustrated map, a Benchmark atlas — all the stuff that will be sliding around the front seat. Before I leave NG Topo I capture the map data for the broad area of interest to my hard drive, in the form of a giant high resolution Jpeg. Usually it’s 30-40 Mb, one big file. That way after I’ve disconnected from everything I can open the image on the road, zoom in for a nice view, and easily pan around. It acts like an enormous well-behaved topo on my computer, with all of the underlying quads seamlessly stitched together. I find myself wandering around happily on this "mother" topo, any time I want to look something up. While map-reading on the trip itself it’s normal to have the mother Jpeg up for reference, once again, alongside Google Earth. So that’s it. By now Google Earth is done collecting. I have a big continuous Jpeg topo of the whole area saved from NG Topo, and enough printouts to cover at least the foreseen eventualities. Stuff the computer, and set it by the door with the rest. The maps are packed. I don’t use GPS. There are times when I wish I had it, and there are some things I could do with it that I’m not able to do now. Like for example in Utah there is this kind of terrain that’s just patchy aspens alternating with open meadows, it gets covered with deep snow and has no trails, but you can see beautiful ski routes from the air in Google Earth which would be quite doable with GPS. So I know what it is, and what I’m missing. But since we are usually in simple open country, not doing anything fancy, our need is more for route discovery and planning — hence, maps — and not so much for staying found, GPS. Likewise I seldom use my compass. I’m good, even excellent, with a compass. I would never hike without one, it’s so lightweight, and once in awhile, invaluable. But anymore, the kinds of things we do, a good map is all we need. I don’t use traditional paper topos, unless I happen to have them from the old days. They are beautiful to look at, compared to the scuzzy little printouts from National Geographic. You can still buy them. But it’s not just the cost that stops me now, it’s the hassle of deciding which ones to buy, then organizing them somehow. Once you get used to the freedom of digital maps you can’t really go back to the traditional quads. My friend Kurt has an iPad running a lightweight topo app. The screen is plenty big enough because it zooms and pans so freely with your fingers; it’s fun to read. Next time you have an iPad in your hand, think of it as a topo map, and you’ll see it’s really not too heavy to throw in a daypack. There are specialized iPad ziplocs for rain, I put links for these in the appendix. Durability isn’t a significant worry, iPads are meant to get used. Kurt is a professional naturalist guide, and when you consider the iPad easily replaces his bird books, plus stores reference PDFs and photos he may want available to show people — things he may already wish he could carry — the weight matters less and less. Right now if you buy the $800 iPad, the one with 3G, you get GPS. It’s real GPS, not the kind that has to triangulate off cellphone towers, so it works in the bush. It probably doesn’t have the positioning precision of a dedicated GPS device. But that’s not a given; people are just beginning to use it this way. And because so few people have the most expensive iPad, the topo apps out there now aren’t yet taking advantage of the GPS capabilities in the device. All this, though, will weave together given time. Right now, in standard orienteering, you hold your GPS in one hand, about the size of a smartphone, and your map in the other hand. The devices are too cramped for map reading. That’s why GPS people are so fascinated by gridlines on maps, they sync their gadget with their paper, by brute force. When the map and the GPS merge and become inseparable in one device, that’s going to be fundamentally different. About one full order of magnitude different. And leaving your old GPS at home, alongside your old bird books, there’s yet one more several-ounce item you can replace with the iPad. "iPad… offers better functionality than the $12,000 panel-mount Garmin GPS in my helicopter. Rather than view my location on a primitive screen display, I can see it on an actual aeronautical chart. I can also download charts and other information in advance so there”™s no need to rely on 3G connectivity in flight… screen size puts my panel mount system to shame… G3 iPad 2… includes a GPS… I am convinced that Garmin and the others will be hurting as in-phone GPS use proliferates. 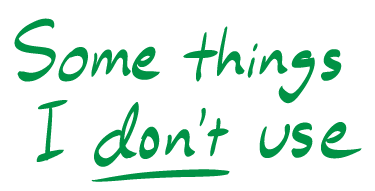 People will simply stop buying stand-alone GPSs." The point here is twofold. The reason iPad has better functionality than a $12,000 system, at 1/20th the cost, is because it’s a multipurpose, mass-produced, mass-marketed gadget. It wasn’t designed to be sold to some little cadre of helicopter pilots. But the second point is this. $800 might seem pricey for a nice topo map. But when it starts to replace your GPS, your reference books, etc etc, it makes more sense. In fact soon you might already own a multipurpose reader anyway, it’s maybe sitting there on the kitchen table used for other things, and all you need do is fire up an $8 map application. That’s when it suddenly gets cheaper than paper. As of right now I haven’t heard of anybody caching a full 2 GB of image data from Google Earth onto an iPad for off-line viewing. I’ve fiddled with Google Earth on the iPad, it does cache, but it just can’t do what a regular computer can do. Nevertheless, that’s coming too. There’s more than enough storage capacity — it’s just a software issue. So it’s easy to imagine being five miles in on a trail, able to view a quick Google Earth flyover of your surroundings, side-by-side with zoomable modern USGS topos, and all the time location-aware via real satellite GPS. That’s not far off, and it would make a very nice map.